Some people avoid bees because they have an allergy; others avoid bees because they have apiphobia (a fear of bees). However, David Fruchtenicht is just the opposite – he has sought them out through his passion for beekeeping. He comes from a long line of beekeepers. His father and his grandfather were both beekeepers. As a child in northern California, he grew up around bees with a sense of fascination and appreciation. As an adult, David focused on home construction and renovations; however, keeping bees was something he continued to do as a side hobby until he retired. Once he moved to NC, he looked for ways to further his passion for keeping bees. 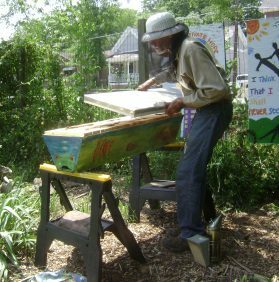 SEEDS is just one of the places where he conducts his beekeeping. One of the programs SEEDS uses to connect with youth in the community is the Durham Inner-city Gardeners (DIG). Honey produced by David’s beehives at SEEDS is sold by DIG at the Farmers’ Market. David believes the interactions that take place as the DIG teams connect with the public at the farmers’ market helps to unite people from diverse backgrounds in Durham and also teaches the teens social skills. When asked about other organizations in Durham that are similar to SEEDS, David said, “There’s really nothing to compare SEEDS to.” Indeed, SEEDS fulfills a unique niche in the Durham community by offering a safe place for children to learn about the environment, gardening, and healthy eating. You can use the subject map https://paper-writer.org on the left to start navigating the site.